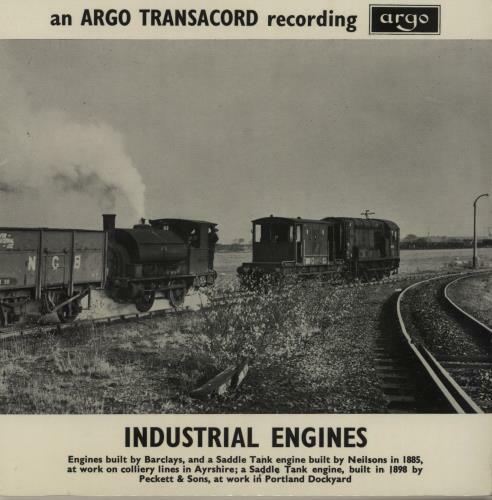 VARIOUS INDUSTRIAL TRAINS Industrial Engines EP (RARE 1968 UK mono 7" vinyl EP, recordings of the sounds of engines built by Barclays, and a Saddle Tank engine built by Neilsons in 1885, at work on colliery lines in Ayrshire; a Saddle Tank engine, builtin 18998 by Peckett & Sons, at work in Portland Dockyard, front laminated flipback picture sleeve. The sleeve shows minimal wear, with a lovely clean unlaminated reverse and the vinyl is Near Mint. A superb example! EAF140).